Peanut Butter Balls with Rice Krispies now in a new, special Valentine’s Day edition in the shape of heart, creamy and crunchy, with just 5 ingredients and only about 10 minutes to prepare….do I need to say more ? Nothing says Valentine’s Day like a heart. 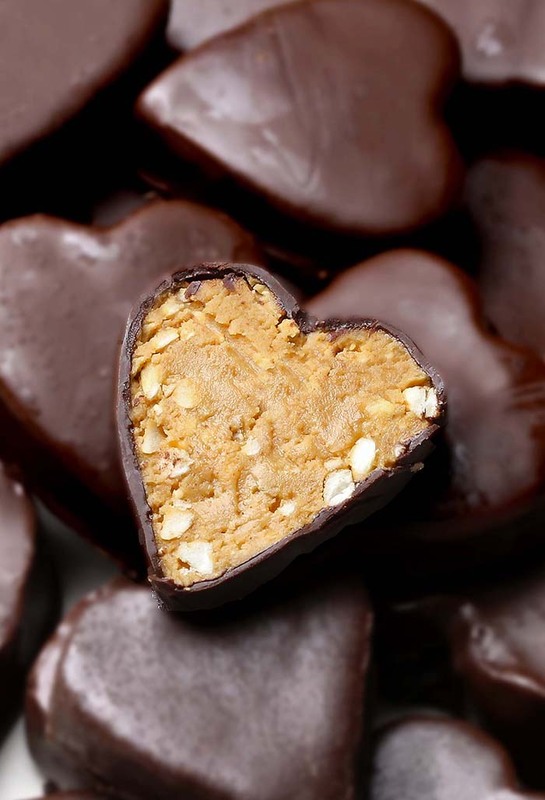 Valentine’s Day is on the way and so are the Peanut Butter Hearts ! And if you have been searching for a quick and easy, yet totally adorable, Valentine’s Day gift, look no further. After such a great response from Peanut butter balls with Rice Krispies, my brain started churning with other similar ideas. Valentine’s Day is so close and I came to the idea to give good ol’ Peanut Butter Balls a Valentine’s Day makeover, and make my Peanut Butter Balls with Rice Krispies in the shape of a heart. These Peanut Butter Hearts with Rice Krispies are everything you’d want in a mini dessert, and the perfect way to show them you care, from friends to family and everyone in between. A ton of sweet flavor in one little rice crispy heart. I dare you to just eat one…ha! Go ahead and eat a few of these because you totally deserve it. Crunchy, smooth, and chocolatey all in one bite. Doesn’t it sound perfect? There’s very little preparation involved in this recipe, which makes it great for crazy busy days (fighting off the million to-dos running through your head to catch a few precious hours of sleep, sounds familiar?). You can throw it together whenever you have time (even the day before is fine) and it will be ready and waiting for you in the refrigerator when you want a sweet treat! 5 ingredients and only about 10 minutes to prepare is all you need. Just butter, peanut butter, powdered sugar, rice krispies and chocolate – it doesn’t really need anything else! Well, You are going to need a small heart shaped cookie cutter to make these. You can use a normal sized cutter if you want, but that will make fairly giant hearts. The cutters I used were 1 1/2 inches across and 2 1/4 inches across. The 1 1/2 inch cutter makes a bite size treat and the 2 1/4 inch cutter makes a treat similar in size to a Reese’s. Which chocolate should I use ? Before I show you how easy these are to make, I want to talk chocolate for just a minute. and doesn’t set up quite as hard – it won’t have that nice “snap” when you break it. You can use candy melts or chocolate almond bark to dip your hearts. These are not real chocolate and so they don’t taste as good, but they are made for melting and dipping and generally set up very hard with a great shine. 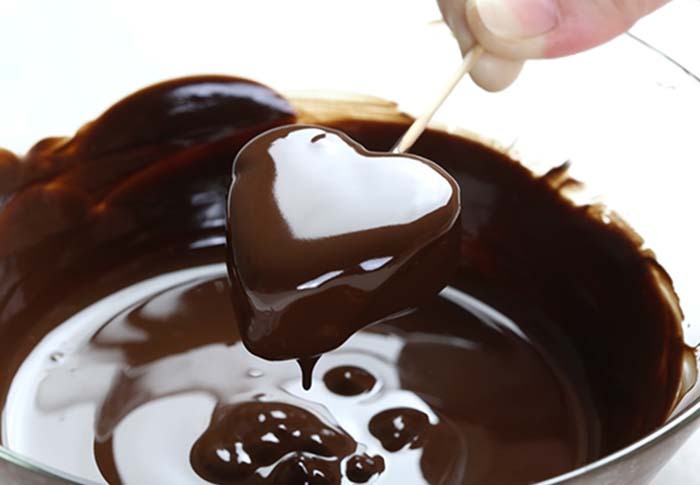 You can use a good quality chocolate and melt it very slowly over a double boiler, ensuring it never gets very hot. It should take about 20-30 minutes. As long as it doesn’t get too hot, you shouldn’t lose the temper and the chocolate should set up just fine. Or you can try a quick and dirty microwave method for tempering the chocolate that usually works pretty well. Start with good quality chocolate chips. Place 2/3 of the chips in a microwave safe bowl. Microwave for about 30 seconds and stir. Microwave for 15 seconds and stir, Continue in 15 second intervals, stirring between each time, until it is melted and smooth. Add in the remaining 1/3 of the chips and stir until they are melted as well. Can I use white chocolate for this recipe? Of course! Just be sure to use the vanilla or white chocolate candy coating instead of the milk chocolate. You can also use Candy Color Melts too if that’s what you prefer. Combine the peanut butter, butter, powdered sugar and rice krispies in a bowl. If PB mixture seems quite sticky, stir in more powdered sugar until you have a cookie dough like consistency. Line 8 x 8 inch dish with parchment paper, let the paper overhang the sides for an easy lift. Pour the PB mix into dish, and press into about 1/2 inch thick layer. Chill until firm (15-20 minutes in the freezer should do it). 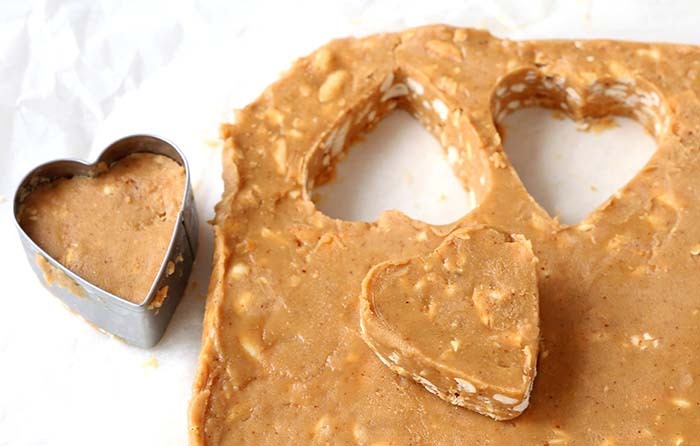 Cut hearts from the PB mix with cookie cutters. Place on a new piece of parchment paper. Freeze again until firm. 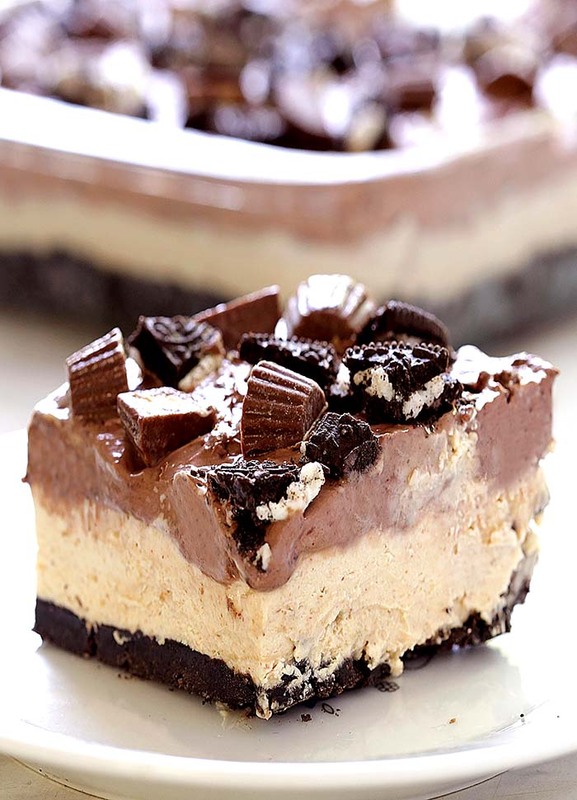 Either eat the scraps of PB mix (don’t forget to dip ’em in chocolate! 🙂 or re-roll them and cut more hearts. Melt your chocolate as directed on the package or using one of the methods described above. 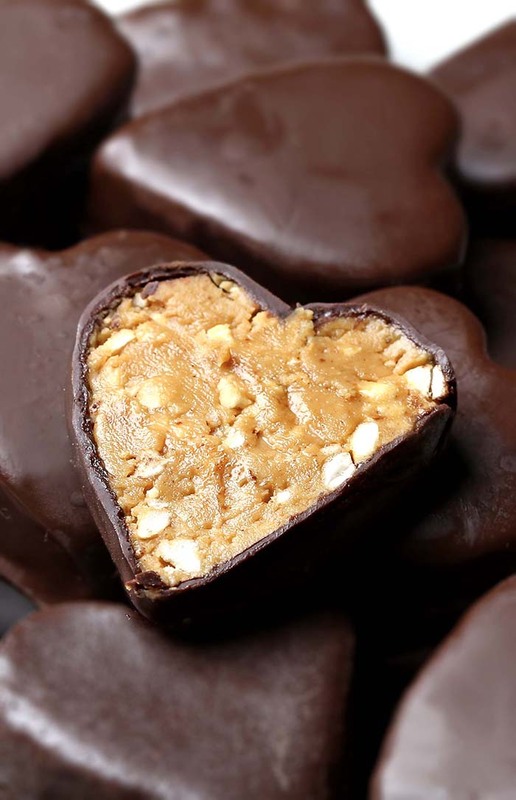 Place a toothpick in each peanut butter heart and dip each into the chocolate and roll around until coated. 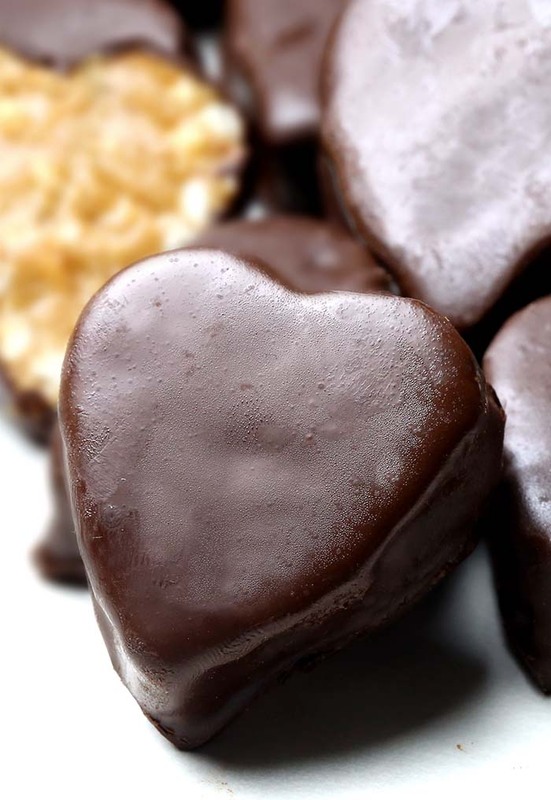 Place the chocolate coated heart on a separate cookie sheet lined with parchment paper. Remove the toothpicks from each peanut butter heart. Place the hearts back in the freezer to let the chocolate set. It should take an hour or two. How to Store Peanut Butter Hearts with Rice Krispies? Once set, be sure to keep these treats in an air-tight container. They last in the fridge for up to a week, but we have a feeling they won’t last that long. Peanut Butter Balls with Rice Krispies now in a new, special Valentine's Day edition in the shape of heart, creamy and crunchy, with just 5 ingredients and only about 10 minutes to prepare....do I need to say more ? Add powdered sugar and rice krispies. Mix until combined. Line 8 x 8 inch dish with parchment paper, let the paper overhang the sides for an easy lift later. Pour the PB mix into dish, and press into about ½ inch thick layer. Chill until firm (15-20 minutes in the freezer should do it). Cut hearts from the PB mix with cookie cutters. The 1.5 inch cutter makes a bite size treat and the 2.25 inch cutter makes a treat similar in size to a Reese’s. Re-roll the scraps of PB mix and cut more hearts. Place on a parchment paper lined cookie tray and chill in the refrigerator for at least 30 minutes before chocolate coating. 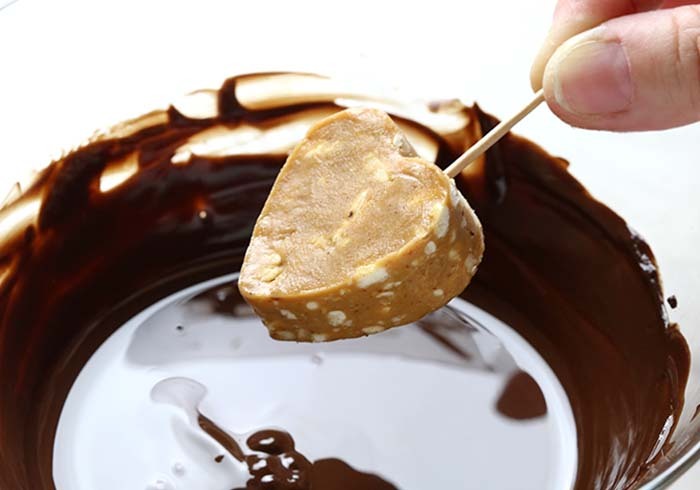 Place a toothpick in each peanut butter heart and dip each into the chocolate and roll around until coated. Place the chocolate coated heart on a separate cookie sheet lined with parchment paper. Remove the toothpicks from each peanut butter heart. Place the hearts back in the freezer to let the chocolate set. It should take an hour or two. Best to store these in the freezer as well. If you store these in the fridge, they will become slightly soft. 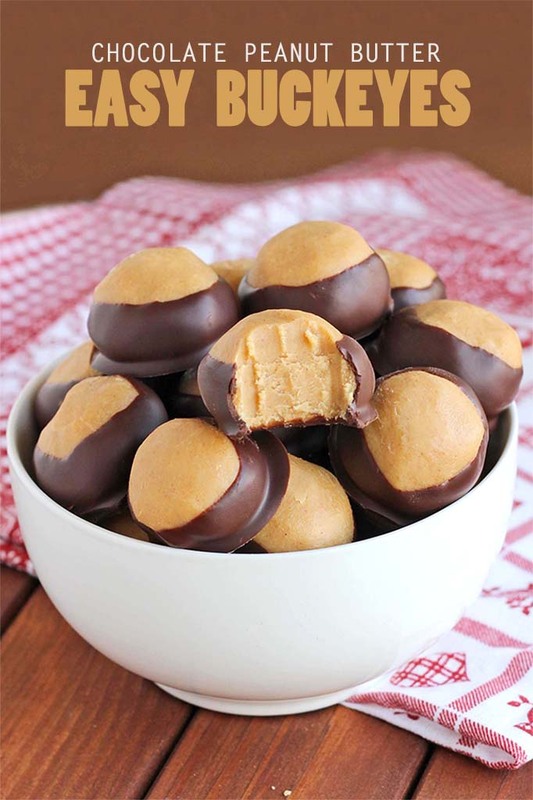 Seriously, you need to make these easy buckeyes. They’re so good, so easy….so delish! This entry was posted in Cakes, Holiday and tagged Chocolate Chips, Crisped Rice Cereal, Peanut Butter on December 13, 2018 by Dan.